Contrast has been known to artists forever now & as somebody who has been painting for longer than he has been cooking, the concept of contrast as an eye-catcher in art settled in easy with me. It was only later when I started cooking I realized that contrast can stimulate all senses not just visual. Textural contrast in food always creates that stimulative wow , whether it is the contrast in the crunch and the Juiciness of the Jalebi or the golgappa or the texture difference felt when biting into an éclair, contrast ALWAYS stands out. Visually chefs have used contrast in colour and height to conveniently direct our eye to the star on the plate or even the buffet. Take the croquembouche for example the tall tower of choux buns that stands out among all desserts inviting you for a taste. Moving onto the contrast in taste ….the contrast of sweet and salted. A phenomenon that’s swept the world is “Salted Caramel”, the pleasing stimulus that this contrast brings about made it the biggest and the fastest growing food trend in America, yes even bigger than wasabi and sushi. 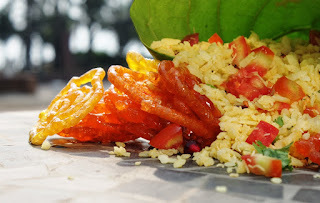 But before we bow to the western ingenuity let's go searching for sweet and salty in our lives and travels...Poha jalebi of Indore , Fafda jalebi of Gujarat, Saag and Gur in Punjab...are food fads from forever. For my travel shows I spoke to a family of “Nagar Brahmins“ a community of Gujarat who claim that the community has been having aloo bhaji and home made ice cream as a sorbet course forever.... now how’s that for contrast!! 1. Heat the sugar over medium to high-heat in the bottom of a heavy saucepan. 2. Continue cooking the sugar until it reaches a deep amber color. 3. Carefully add the butter. Whisk until butter is melted. 4. Remove the pan from the heat and slowly pour in the heavy cream. Whisk until cream is incorporated and caramel is smooth. 5. Whisk in the fleur de sel or Maldon sea salt flakes. Your salted Caramel Sauce is ready!! The way that you have presented the story of contrasts is so amazing and actually inspires to think that everything in this world is a contrast, a stark contrast. Anyways talking about your food blog, not only is your recipe perfectly written, and i say this because i tried it but also the story makes it so appealing that it inspired me to head straight to my kitchen to make a Art of Contrast (salted caramel). Keep inspiring. Your blogs are a treat to read as well as cook.